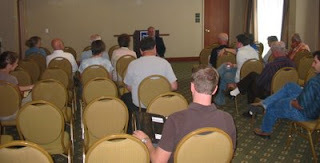 I went to a hurriedly-scheduled "town hall" meeting today with my Congressman, Bill Sali. Long-time readers will remember that I'm not a big fan of Bill Sali; I feel that our district deserves a Congressman who is able to work with people to get things done, rather than just embarrass himself with insensitive gaffes and be on the losing end of a bunch of 403-18 votes. We ended up with a few people showing up late, so overall attendence was about 30 people -- probably 90% of them Sali supporters. Congressman Sali has always been very personable when I've seen him before, and today was no exception. He opened the meeting by apologizing for the short notice, and explained that he had planned to go to ANWR this weekend; unfortunately, he was unable to arrange for transportation. He said the reason for that was that the "Democrat Congress" had passed an ethics bill that made it so that Congressmen couldn't get free airplane rides from lobbyists anymore -- apparently, he's against that restriction. He started off talking about high energy prices, and said that our problems are caused by the "Democrat Congress" not allowing us to drill off the coast and in ANWR. Never mentioned was the fact that it would take years for any of this oil to get into the marketplace, and it would have no real effect on prices for a long time. While I personally don't have a big problem with drilling for oil where we can in an environmentally-conscious manner, I do know that it's neither a short-term nor a long-term solution to our problems by itself -- ANWR would provide maybe 1% of world oil production by 2030. He then moved on to attacking entitlements, including problems with Social Security. I asked him about his campaign promise in 2006 to reveal his plan that would "protect Medicare and Social Security for all generations" by reducing payroll taxes. Amazingly, he flat-out admitted that he was wrong; he claimed he "had" a plan, but when people with an actual clue looked at the numbers, they convinced him it wouldn't work. Then an older woman mentioned how her Social Security check wasn't going very far, and the crowd started getting ugly. While Congresman Sali responded to the woman with comforting words, I heard people snidely whispering behind me that "I bet she hasn't paid into Social Security as much as she's getting out." Congressman Sali, who had attacked opponent Larry Grant in 2006 over his admission that we'd have to balance intakes and outlays of the program (either by increasing payroll taxes or pushing back the retirement age sometime in the next 30 years), basically admitted that the math just doesn't add up -- by 2040, you'll have 2 contributors for every recipient under the current rules. While he's a canny enough politician not to come out and say that you'd have to reduce or delay benefits to get it to work, it was clear he thought that was the only option if we want to keep Social Security solvent. At this point, a Sali supporter asked him if Congressman Sali ever gets down-hearted by all the people saying bad things about him; specifically mentioned was the new "Bill Sali Hates Idaho" website. Bill Sali said basically that he's OK with himself standing by his principles, and if the people elect someone else, he'll take it with good grace. I followed up by asking him, in the manner of Bob Slydell from "Office Space", a variation on "What exactly is it that you do here?" [Long version of the question: I first thanked him for getting the PUC for VO-67, and then pointed out that he really hasn't accomplished anything else tangible during his tenure, other than be on the losing end of a bunch of lopsided votes. I mentioned that his much-hyped "Always Think Freedom" bill wouldn't even get a hearing (he didn't disagree), postulated that his "Simplify the Tax Forms" amendment would probably get dropped in conference (he said he thinks it will survive, so I'll believe him for now, even though he didn't disagree with my characterization of it as "without metrics" and therefore basically meaningless), and pointed out that his co-sponsorship of bills like Rep. Ron Paul's "U.S. Out Of The UN" H. R. 1146 was completely pointless, since there's no chance that any of these bills will even get a committee hearing. I concluded that the only tangible effect of having him in Congress seemed to be that our district got less federal money than we would have had we elected a Democrat in 2006.] He chose to focus on why he signed on to co-sponsor the UN Bill, and fell back on "American sovereignty" -- he didn't mention why he wasn't supporting a "U.S. Out Of NATO" bill, since that organization actually would force us to go to war when we might not want to, which seems like a bigger threat to our sovereignty than the UN would ever be. He then went on to claim, bizarrely, that he doesn't think the House leadership would have given more money (in the form of earmarks) to a freshman Democrat in an unsafe district; instead, he claimed that he'd gotten more earmarks than "most" of the freshman Democrats. Other than my amazement at seeing a supposedly fiscally-conservative Congressman claiming as his main achievement a whole bunch of earmarks, I really doubt that he had more than "most" freshman Democrats (since that group got $237 million in earmarks, and freshman Republicans got only $36 million) -- maybe he did, though, because the district has so much land. Hopefully Mountain Goat has the research on that tucked away somewhere. At this point the meeting got a little uglier. One woman behind us complained about everyone having an "entitlement mentality" and wondering why the government had to help people at all, especially people who were hit by natural disasters. Congressman Sali admitted that he thought that there were things the federal government probably should do to help people in that situation. (He didn't mention the actual unspoken reason that the elites decided long ago to help people down on their luck -- that it's much better to make sure everyone has enough to eat than to drive them to desperation, where they end up robbing people like the woman who complained about her tax dollars going to help "undeserving" people.) Another woman in the row behind us then started to quiz Sali about his salary and benefits; her point seemed to be that people who work for the government shouldn't have pensions or health care. Poor Congressman Sali tried to protect himself from the onslaught, and I felt so sorry for him that I spoke up and said that I thought I had earned my government pension. The woman was gathering herself up to keep going when SubBasket turned and asked the woman if she thought that having to go through 4 six-month separations didn't maybe mean I'd earned something. The woman behind us didn't say another word. After that, a woman complained about the state of education in the country; Congressman Sali replied that one of the problems is that we can't even hire all of the foreign students who get advanced degrees here. Apparently, he supports the granting of more H-1B visas; interestingly, he doesn't mention that on his campaign website. Update 2051 13 July: When I was at work today, I remembered an additional piece of information from the meeting. Congressman Sali did seem to suggest that Social Security could be "saved" by the government getting $60 trillion (say it like Dr. Evil for full effect) by having all energy in government lands extracted -- here's another Congressman talking about that. I put this under both the "patently absurd" and "against the laws of physics" categories, in that most of the energy can't be extracted with any current or planned technology, our current GDP is only about $13.3 trillion (so who's going to pay all this money that doesn't exist? ), and when you've collected all the money (if it was even possible) you now have no energy supplies left in the country. Good article. I disagree with one thing though. Oil prices have largely been driven by speculation and sensationalism. It's not as if the price has tripled because the demand has tripled or production has been cut. As such, just an announcement that we are going to go after coastal oil (forget ANWR, the coasts have a lot) it undoubtedly would impact prices. And saying it would take years to have an impact on supply numbers may be true but isn't really a good reason to do nothing now. I guess it might be if you think this is a short term problem that is going to work itself out. That might be true but the cynic in me doubts it. In any event, the Republicans had a chance to do something about this before they lost the congress and didn't. If their claims are correct that drilling in ANWR and coasts would be a relief to oil prices then it would've been kinda nice if they had done something 5 years ago. Maybe we wouldn't be here now. Get a clue, schmoo. "Controlling" Congress isn't achieved by having a simple majority...or did you flunk Government 101? Yah, put the Demo's in charge. I'm sure that'll make your ANWR drilling happen real soon. I mean...just who is that dumb? People whose arguments are couched in the lazy- (and very-dumb-)think that "it" is all the Republican's fault, or "it" is all Democrats fault are a waste of oxygen. I disagree that drilling (anywhere, not just ANWR), even if it takes 5 years to pull oil out of the ground, won't have an impact. It would immediately have an impact on speculators as it sends a signal that we're serious about creating new supply. Either you believe it's a free market and there's more demand or less supply, and there is not demonstrably less supply, so the demand is driven by both real increased demand (China, India) and speculative demand (the futures market). As for Congressman Sali, I don't think how much bacon you bring home is something fiscal conservatives should be voting for. But, hey, maybe that's all being a Congressman is ultimately about. A sad state of affairs. Good comments. I also think that maximizing our domestic production, as carefully as we can, will have an impact on the world oil price in the short/mid-run while we work on alternative energies. The excuses that "we can drill our way out (subtext: therefore we can ignore our domestic supply and protect our environment) of this problem" ignores reality in favor of starry-eyed piety. Fabulous post. Should be required reading, including all the links, for every Idaho voter. Today the House is voting on a resolution commemerating the 50th anneversary of the USS Nautilus crossing the North Pole. A lot of people think all of these proclimations are silly, but while they're giving props to the submarine force, they won't be taking any more of our tax dollars. The text of the USS Nautilus bill is... here. "Declare a national emergency and rule by decree"? And the President should "keep that option on the table"? Does he really know what he's saying? Did no one in the roomcall him on it, or are they all royalists? Try to question your representatives about why drilling on already leased lands isn't happening, when there are already proven oil reserves under those lands. Why do we have to create new leases when the oil companies won't drill on the ones they already have? Sali voted against a bill requiring oil companies to drill on those lands. Or just blame the Democrats for being controlled by environmentalists.. Maybe it's all the same. USS Henry M. Jackson Crew Sports New PT Duds! Where Have You Gone, EM Log Blogger? Kazakhstani News -- News You Can Trust? Where Is This Submarine Exhibit?